also known as Caldwell 27, and Sharpless 105 is an emission nebula, 5000 light-years from Earth. 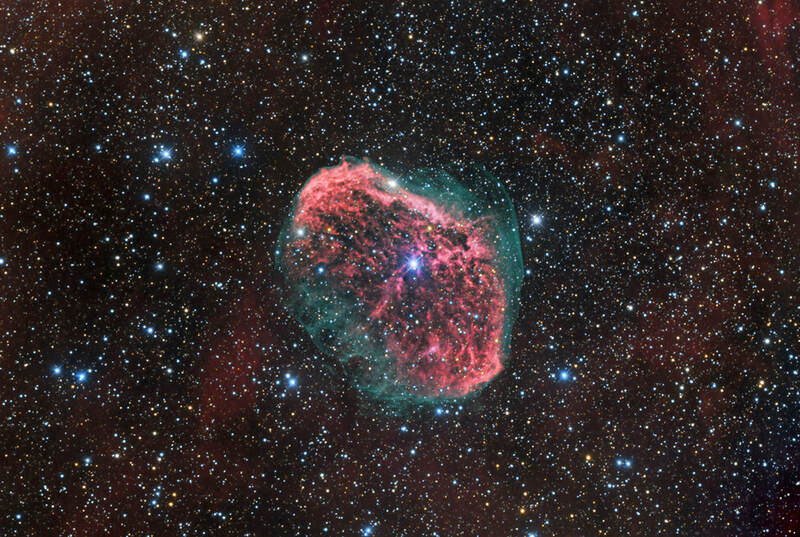 Discovered by William Herschel in 1792, it is formed by the fast stellar winds of a super-hot Wolf-Rayet star WR 136 (HD 192163) colliding with and energizing the slower moving winds ejected by the star when it became a red giant 250,000 years ago. The result of the collision is a shell and two shock waves, one moving outward and one moving inward. The inward moving shock wave heats the stellar wind to X-ray-emitting temperatures. While the (Ha)LRGB data was captured by my New Mexico observatory, SSRO partner Mark Hanson was kind enough to provide the data of the OIII outer shell in 2018.